Have you had a chance to catch up with some of the amazing makeup that went on at London Fashion Week? For what it's worth, I'd say that this fall's beauty game is even more on point than last spring's (though I'm still not over the purple liner from Michael van der Ham) — pretty much every show had the perfect makeup to complement their Spring 2016 Ready-to-Wear collections. The looks span from office-appropriate (hello, It Girl-worthy burgundy lipstick at Burberry) to date night approved (hey, you can never go wrong with velvety red lips and on-fleek brows, a la Anya Hindmarch), to just plain crazy-pants (yeah, the ultra-shiny pearlescent complexions at Vivienne Westwood Red Label might not go over super well at your next Sunday brunch... but then again, it wouldn't be Westwood without some serious risk-taking). 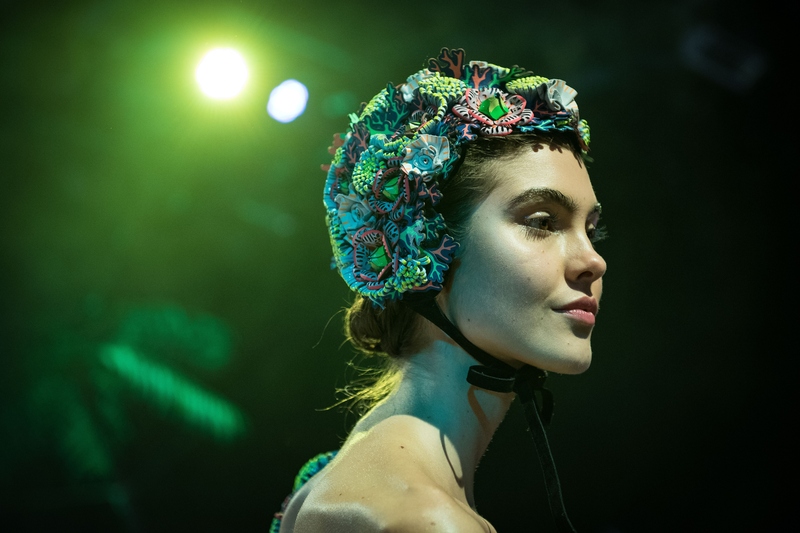 At any rate, this autumn's LFW boasted quite the melange of covet-worthy looks — from the mid-century-meets-'90s grunge eye shadow/red lipstick combination going down the runway at Topshop Unique, to the fairy princess-level illuminator at Sophia Webster (seriously, it's Glinda the Good Witch-approved), to the respectively insane lashes looks at Mary Katrantzou and Thomas Tait, there were dozens take-your-breath-away beauty moments... so let's take a look at some of the best! Jonathan Saunders had some of the coolest eye makeup around — and this high-impact cobalt blue look was especially on point. Sometimes, you just can't go wrong with a classic red lip — especially with a fetchingly grungy twist. Makeup artist Hannah Murray described the look to the New York Times as "Princess Margaret meets Courtney Love," and went on to explain that she achieved the smudged-yet-glossy lids by mixing Vaseline with eyeliner. How's that for some high-impact, high-end, high-fashion panda eyes? Dramatic (yet retro) brows, immaculate red lipstick, chiseled cheekbones, and — if you look closely — blue eyelashes? All awesome ingredients, combined together for an even more awesome final product. On-point strobing plus lovely pink lipstick makes this bathing beauty look both ethereal and unforgettable. Is this finally the year that colorful mascara will really take off in earnest? The red lips at Anya Hindmarch definitely gave the red lips from Topshop Unique a run for their money. Well now, that's certainly taking the clumpy lashes trend to the next level. Everyone loves a cat eye with a twist. Westwood showcased lots of different makeup looks at her Red Label show, but these mother-of-pearl complexions were among the most fantastical of all. Move over, opal hair — looks like opal faces are coming our way next. Leave it to Burberry to execute the fresh-faced metropolitan gal look to perfection. Want more awesome beauty? Check out the video below, and be sure to subscribe to Bustle’s YouTube page for more hacks and tricks!